This week the world-famous Calgary Stampede kicked off…which means Calgary basically shuts down for 10 days and enjoys lots of sun, rodeo and ummm, beverages. 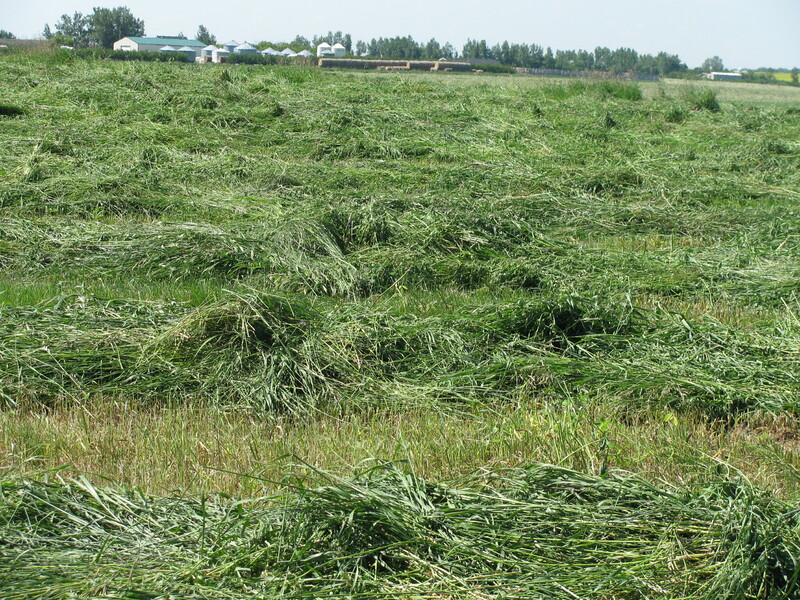 So, around here that means….haying. This week my darling husband got the discbine out of the shed, tuned it up and started cutting. 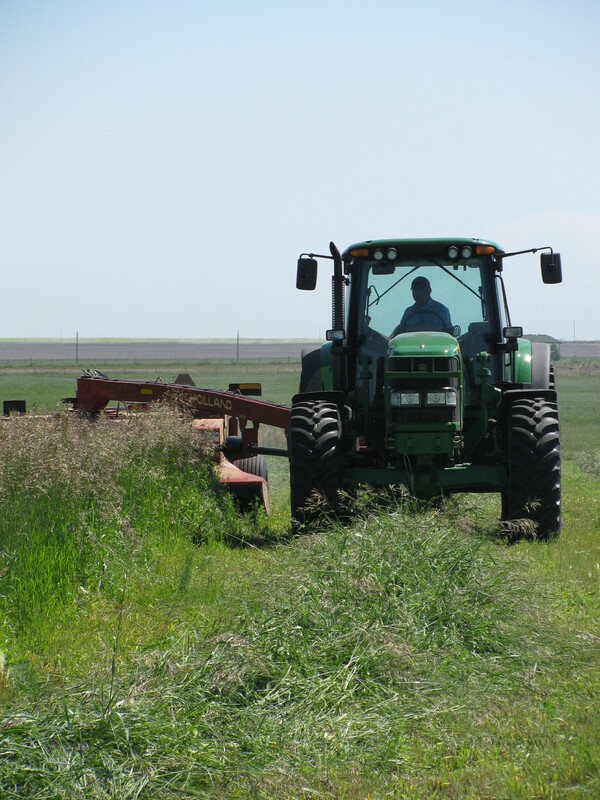 He averages about 100 acres in a day (12-16 hrs) if everything goes smoothly. But, of course, life on the farm never goes smoothly. So 3 days in we have had 2 breakdowns. Minor ones, but still annoying! At this point we have 180 acres down and 200 to go. Once the hay is cut it needs 3-7 days to cure (dry) in the hot sun, then it’s time to rake (pile two swathes together) and bale. Which around Calgary Stampede time is wishful thinking….has there ever been a stampede that it didn’t rain (or hail)?! Hi there! I just found your blog this morning, and I love it! We, too, have a farm (here in Arkansas) and my husband was out bailing hay today. It never ceases to amaze me that no matter how new or expensive the tractor/equipment is, there is always some sort of breakdown. Oh, by the way, I LOVE the name of your blog! Hello and thank you!!! I love hearing from fellow Farmer’s Trophy Wives!! 🙂 How is haying going?! Rain here….darn it! The end of July is creeping closer and haying is stalled out, this might be cutting into my vacation time!! It rained here the past couple of weeks, but we’ve got hay on the ground now. I think he’ll (not me, though I have helped before – mostly by sitting in the tractor and keeping him company haha) start bailing tomorrow. Just gotta make sure he takes lots of iced tea or powerade with him! It’s so hot here! Florida! Sounds fantastic! Thanks for reading and for the good wishes…so far have gotten 2 inches in the last day and a half on the hay…oh well! Rain day meant I got to go to the Calgary Stampede…so it’s not terrible…. 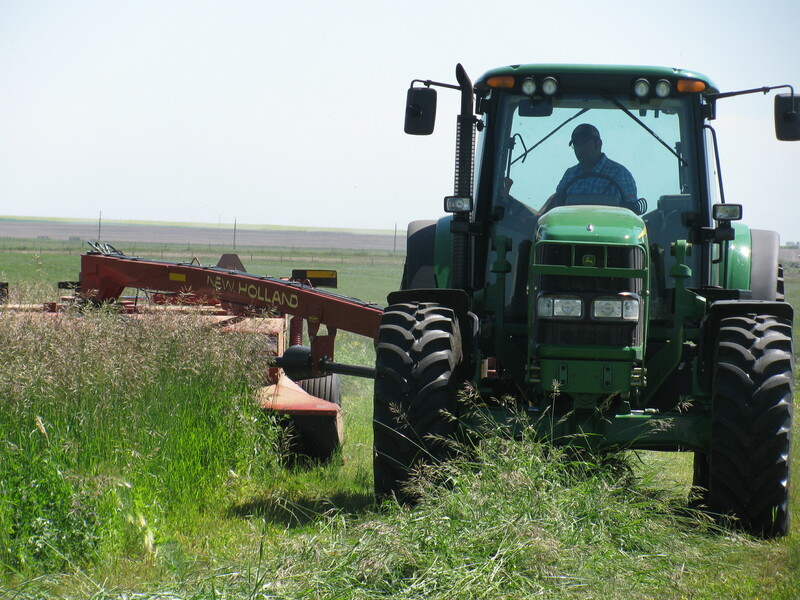 We are busy, busy haying too! The crops are unreal, there isn’t any raking swaths together here! So far we are getting double the bales we got last year if not more! Hope your haying goes smoothly and no more breakdowns! That’s fantastic! We are hoping for more bales this year too…so far looking promising! But the darn rain (and hail! ), oh well. As my husband says, 7/10s on the hay still means 7/10 on the crops! Hey My Dear, Great article in the Herald on you! Love your picture you look great! Hey, just read an article online in the Calgary Herald about your blog! That’s so great! Aw thanks! It is pretty exciting! Thanks! We are hoping too!